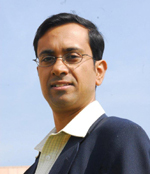 Rajesh Chakrabarti is a member of the faculty of finance at the Indian School of Business, Hyderabad, India. He is also a columnist for the leading national business daily, The Financial Express. He has previously taught at the College of Management, Georgia Institute of Technology, USA, and the University of Alberta, Canada, and has held various visiting positions, including those at the Indian Institute of Management, Calcutta, and the Federal Reserve Bank of Atlanta. Professor Chakrabarti’s research interests include the areas of Indian financial markets, international fi nance, microfi nance, and political economy. He has published several articles in top academic journals, including the Journal of Financial Economics, Journal of Banking and Finance, Journal of Financial Markets, and the Journal of International Business Studies. He has authored two books, The Financial Sector in India—Emerging Issues and The Asian Manager’s Handbook of E-Commerce and edited a recent volume titled The Other India—Realities of an Emerging Power. Professor Chakrabarti received his Post Graduate Diploma in Management (equivalent to MBA) from the Indian Institute of Management, Ahmedabad and a Ph.D. in Management from the University of California, Los Angeles (UCLA).